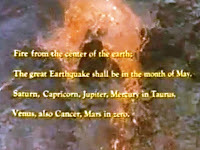 Nostradamus Prophecy for Great Quake in Month of May 2013? Nostradamus has made a lot of famous prophecies , But one yet to be fulfilled exactly is the Great Earthquake in the Month of May! On May 8th 2013 , We find the exact alignment that Nostradamus wrote of! Well nothing so far in this time zone at least, let's see what the next day brings! Venus isnt in the line up until the 28!